Today, my youngest child turns 18 years old. Legally, he will be an adult. In fact, at his oral surgeon appointment this week since the day was so close, they made him sign all the consent forms as well as me. Emotionally, he is far from being an adult and still has pivotal roads to choose and travel. I remember so clearly the very first moment that I looked into his dark eyes. He had the most powerful and concentrated stare from birth. He seemed so serious and seemed to study me so intensely. He was a force to be reckoned with from birth. The very first night home, he cried nearly the entire night. I was breastfeeding, so if I did not have him at the breast it seemed he was crying. He could definitely make his needs be known, and he seemed angry to be a helpless babe. The crying began to subside as soon as he developed some control over his world and could sit up and interact with smiles and babbling. 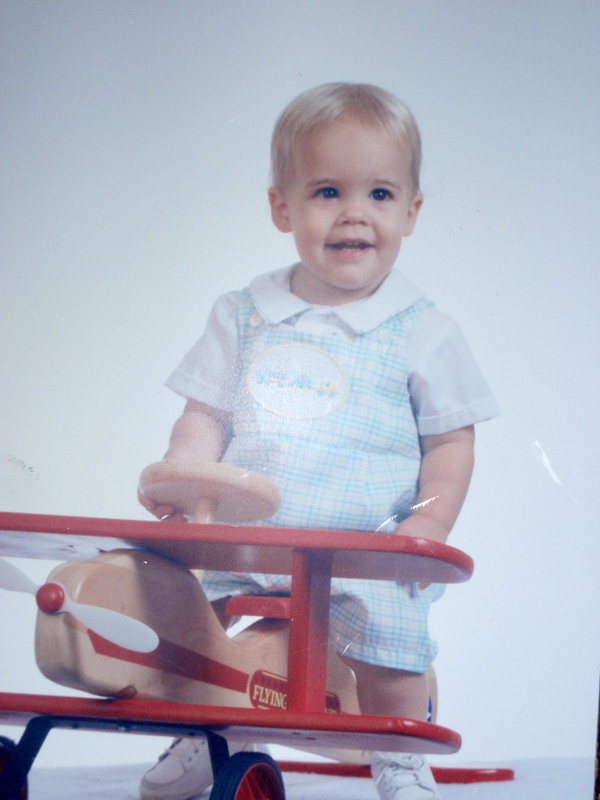 He was a beautiful baby and by 5 months had a head full of soft, blond, angel hair. With those big brown eyes that twinkled with mischief and that mop of white blond hair, we did not stand a chance. He was rotten from toddlerhood. He made us laugh constantly with his antics and his personality. If you could fall from it, through it, or in it, he did. If you could climb it, he would climb it as skillfully as a little monkey and we so we often called him ‘monkey.’ Eventually he became little Al to both Kenney and I and neither of us was very good at resisting his powerful charms. With Alex, it was either all good or all bad. He was either having the best moment of his life or the very worst. He could throw a fit to rival the very best tantrum throwers I have ever seen. We were not used to this at all. His older brother, Jason, from birth was soft-hearted, golden, and sweet. He was easy to please, easy to raise, a joy to parent. Alex was the challenge that was thrown our way. He took our world and shook it upside down. But, we are all the richer for having him in our lives. These brothers have always had much to teach one another and will continue to complement one another and lend lessons to the other as they navigate manhood. I am a so grateful to be a mother– to have two sons who are healthy, well, funny, intelligent, and gifted in so many ways. And so to my Mother’s Day baby, Alexander Scott, I wish you the happiest of birthdays and I pray that your life will be rich and full and that your journey will always be interesting and satisfying. 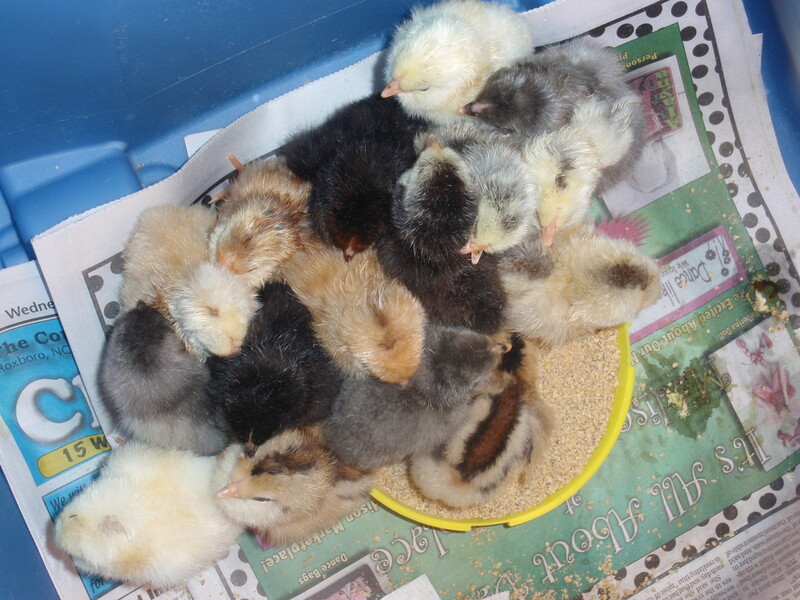 Today is Thursday, May 6th, and the last two days we have just been basking in the warm joy of 16 fluffy chicks to watch and hold and marvel over. 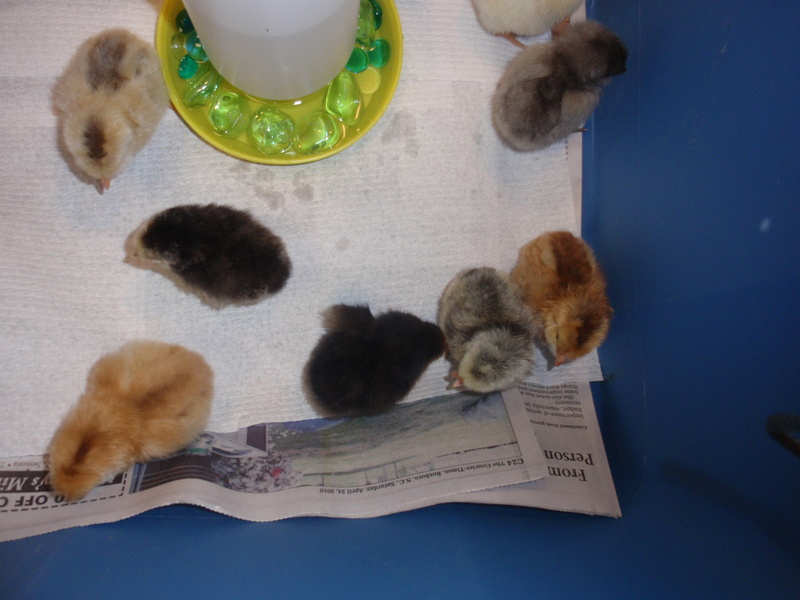 On Wednesday morning we transferred all sixteen to the brooder. Both Sophia and Tammy were very surprised to find that the brooder is a large blue plastic crate with some wire pulled across the top, some newspaper in the bottom, and a water and food bowl. I think they were expecting some official sort of brooder… Cathy was like .. 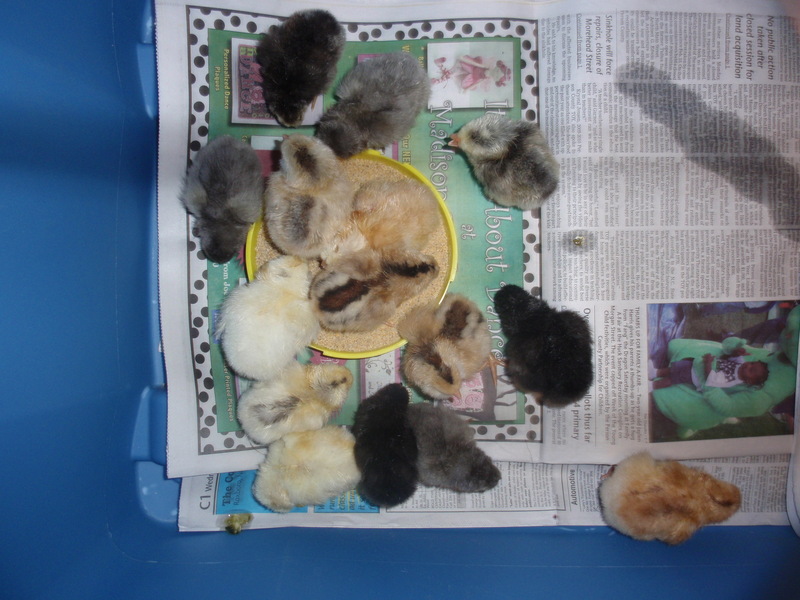 I have a brooder at my house too if that is what a brooder is ;). Seeing the chicks for the first time all fluffed out and in the bottom of the brooder was such a thrill. They are so colorful and already have personalities. We immediately began to name certain chicks. Uno was what I called the firstborn gray Bantam, and Beyonce earned her name because when she was born she had a big backside that caused her to fall over. Moe immediately named one after himself that he found captivating– one of the chipmunk looking chicks. We named the another one marked like that with softer lines, Mocha. Melissa is a black chick with a red head. Of course Mumble is our special chick. It is completely appropriate that we ended up with at least one special chick. As we were trying to hand feed Mumble the first time and talking about his ‘disability,’ Moe Moe commented; “we can get a check for that one.” We lost it completely. These kids are so funny. Today right before lunch Mumble began to make this high-pitched plaintive chirp that got my attention. I wondered if he was just beginning to have some hunger pains, so we held him over the table on a paper towel and began to feed him and offer him water with a plastic spoon. His bottom beak is exposed and like a narrow bowl and when you drop some mash into it he can rake it into his mouth with his long tongue. He lapped up the food and the water until he was full enough to stop all that loud peeping. We fed him several times more today, but we are trying to teach him how to do this himself. He is not going to be able to peck at his food. He will basically need to use his beak as a shovel and then use his tongue to get it the rest of the way into his gullet. He seems to have an easier time getting water. Our other school nurse, Lindsay, fed him a couple of times today but she gets so sad over him. He doesn’t make me sad. I just hope he can learn to eat in a way that will allow him to thrive. Our room has frequent visitors in and out all day long. Everyone wants to see and hold the chicks. The regular education kids are hilarious as well with their comments and questions. One girl this afternoon asked me if they were ‘going to get to be big chickens?’ I am really not sure what she even meant by that. Half of them want to take one home and keep it in their bedroom. I remind them that in less than 5 months they will be great big hens and roosters and much less adorable. In fact, I just kept marveling yesterday that they were the cutest they were ever going to be. Today you can already see some feathers emerging on the wings and they seem bigger in one short day. I was too tired to blog yesterday since I stayed at school until midnight the night before birthing babies. By the time I got home last night there were 16 chicks and that is the final total out of 23 eggs. That is a 70% return and I am over the top excited, surprised, grateful for that number. They are such a beautiful, diverse, little flock and we even got a special chick in the bunch. But, let’s go back so I can get all this in. Yesterday, when I arrived to school, three more chicks had been born in the night bringing the total of chicks to 5 at 7:30 am on May 4th. At about 8 am we had another birth and by midday we had 9 chicks. 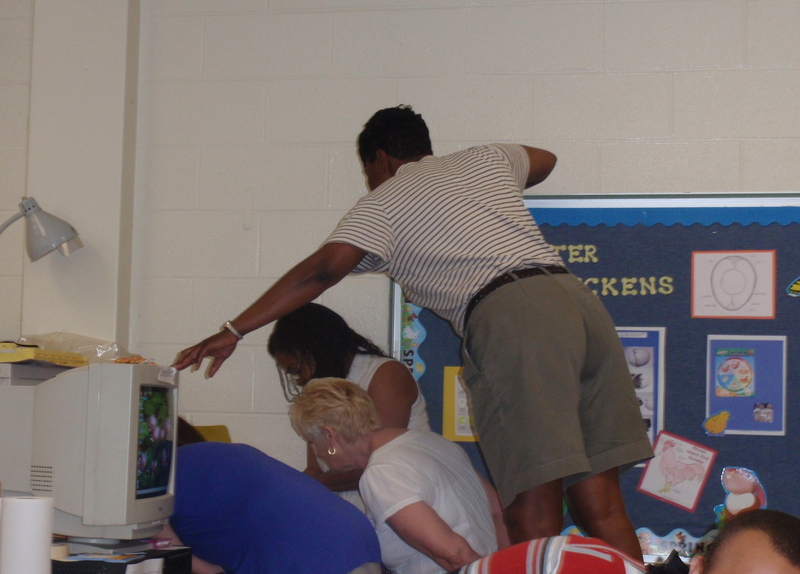 Our classroom was like a zoo with people coming and going all day to see the chicks being born. Students could not stay in their seats and went back and forth all day to the incubator to watch for new hatchings. The chick pips a single hole in the shell and then breathes air for the first time. After resting and acclimatizing, the chick will begin to use the egg tooth to zip open the egg in a circular fashion then they begin to stretch and kick. Eventually, the egg begins to move and roll back and forth as the chick rocks its way out. Finally, near the end of this process in a matter of moments the chick makes a few final big moves and slips from the shell. After this, the wet and tired chick will sort of lie in a heap until it regains enough energy to try its legs at walking. 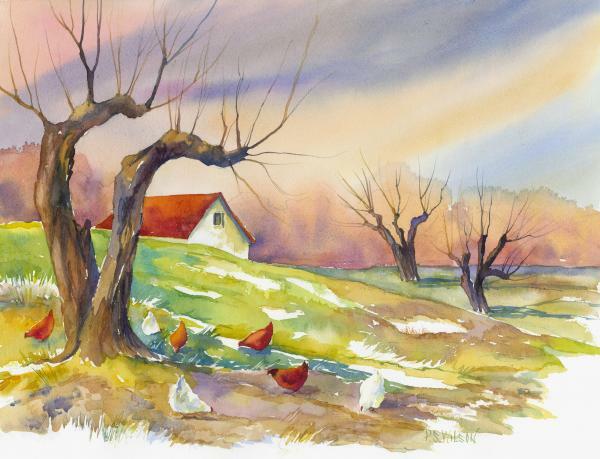 Each time a baby chick was born we would remove the eggshell from the incubator and sometimes it had a bit of afterbirth in it. During one birth mid-afternoon, a chick was born who had its yolk sac still attached to its umbilicus and there was some blood. The sac is supposed to be sucked up into the chick through the umbilicus right before hatching and this is what sustains the chick during the first two days of life. This little bloody chick was freaking me and Sophia out enough, but on top of that the other chicks were pecking at the sac like they were eating it and so I ran for the school nurse [who is also our chicken expert and the egg donor]. She picked it up and sort of detached the sac gently and we put the little bloody chick into a paper towel lined plastic container so that it was separated from the others. I was really worried about this chick, but he was right as rain by this morning and joined the others. I actually knew he was okay when he stopped bleeding, fluffed up, and was trying to jump out of the cup and join his siblings. I came back to school after supper and a couple more chicks had been born, when I noticed that one of the chicks had a deformed beak– the bottom of the beak points one direction and the top beak points in another direction entirely. I quickly googled this condition and found that it is a caused by a genetic fault and chicks born like this are commonly called crossbeaks. The color of this chick is unique as well. He has a dark underfluff with yellow on top of that so that it makes him look sort of evergreen or green-gray sometimes. In the morning, Ms Burton recalled the chick that was different in Happy Feet named Mumble and so we named him Mumble. 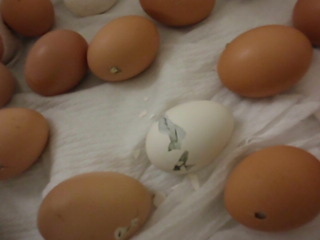 I stayed at school that night [Tuesday] until 11:30 witnessing what turned out to be the last chick birth. I am just getting home from school for the umpteenth time today and it is 2 minutes until midnight. 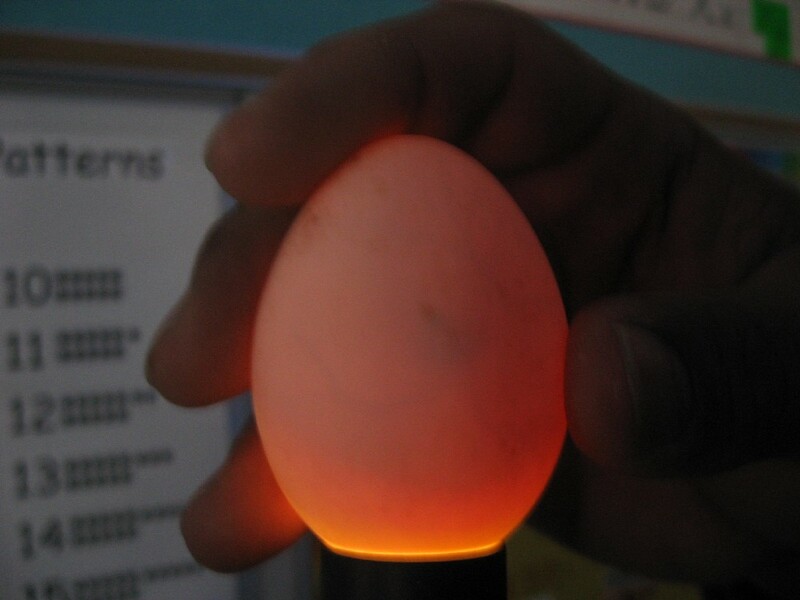 When I arrived at school this morning, I had every intention of removing the turning mechanism and putting in some wet paper towels to get ready for the hatching which was due on Wednesday!! 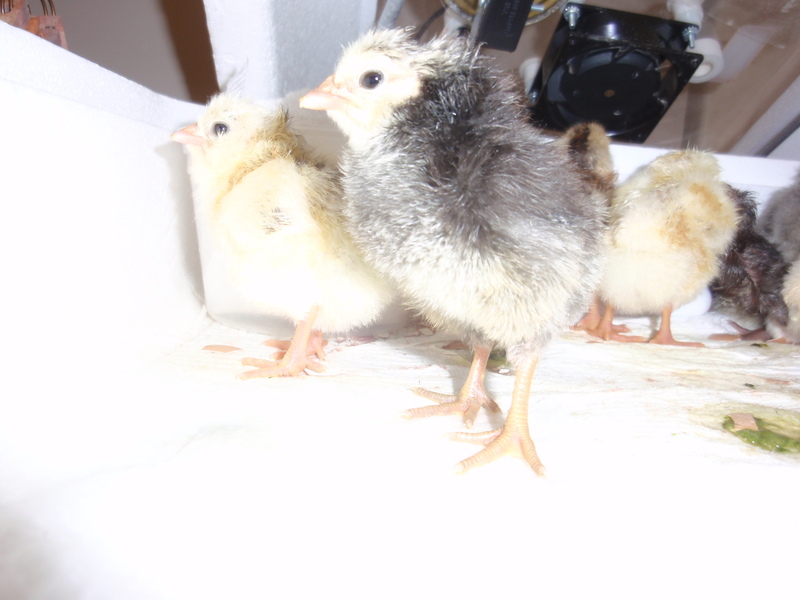 However, when I looked into the incubator I was surprised to find the chicks were already pipping. I think that is correct phrasing… the chicks pip not the eggs. I believe the chicks pip the eggs. Anyhow, there were 8 or 9 eggs with pipped holes in them and I could hear peeping and chirping. Well, I immediately sprang to life and action getting the warm water and paper towels and rallying the children like we were going to actually birth some babies. All this excitement gradually gave way to anxious waiting as the day went on. 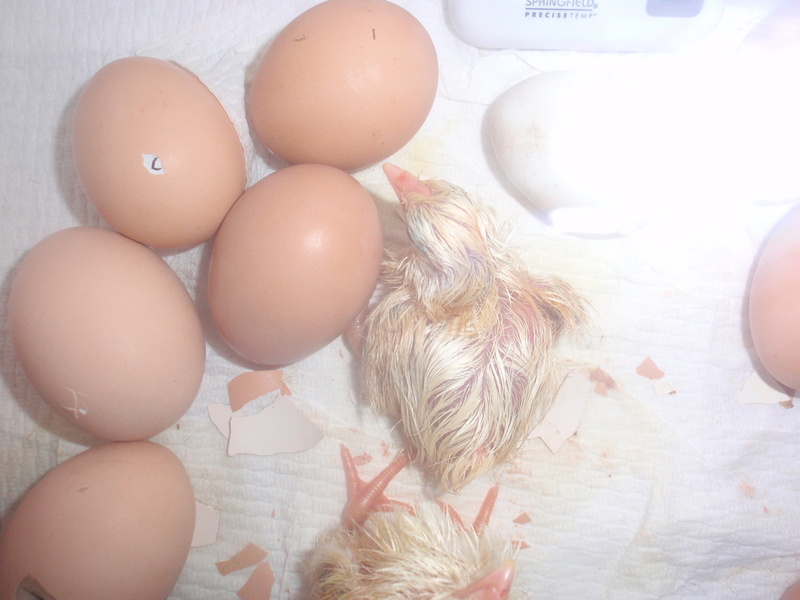 I was busy googling whenever I could trying to make sure our chicks had not pipped and died. 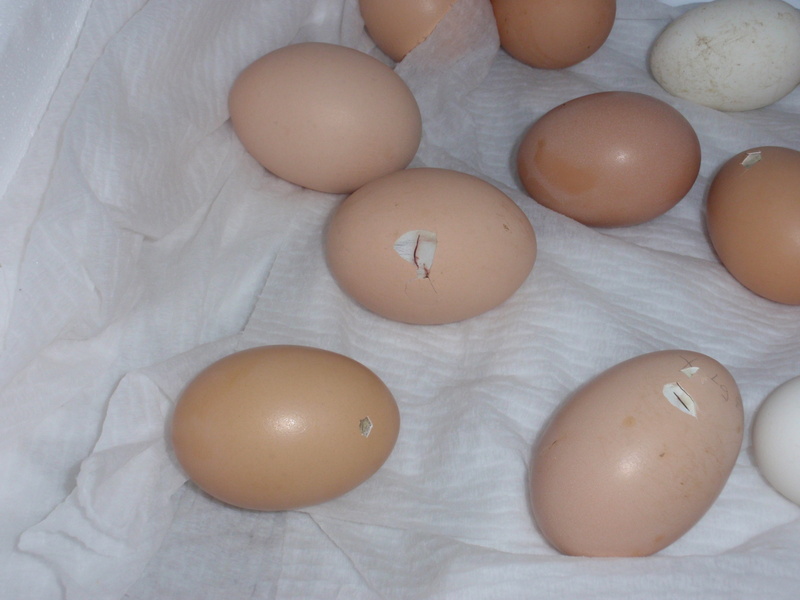 I discovered that after pipping, they typically rest for 3 to 8 hours since the actual breaking of the initial hole in the egg is so incredibly exhausting. So, I guess during the school day, we were observing the rest phase. Sophia did not want to get on her bus and I did not want to leave after school. The peeping was getting louder and some of the eggs were beginning to move, so I just stayed at school until 7:30 or so. About 7 pm I was able to film the first chick hatching, which was absolutely awe-inspiring. I was mesmerized and delighted. I came back to school at 8:30 and then again at 11 and then again at 11:30 and when I came back at 11 another chick was born. I have been trying to upload a video to this page for the last 15 minutes and no luck. I will try tomorrow since I am too tired to reason.